OREANDA-NEWS. Eutelsat Communications (NYSE Euronext Paris: ETL) has selected Airbus Defence and Space and Orbital ATK to build a new satellite for the key 5° West orbital position serving mainly video markets in Europe and North Africa. Under the terms of the agreement Airbus Defence and Space will build the satellite’s payload while the platform will be manufactured by Orbital ATK. To be launched in 2018, EUTELSAT 5 West B will replace the EUTELSAT 5 West A satellite, a key digital infrastructure addressing predominantly French, Italian and Algerian broadcast markets. 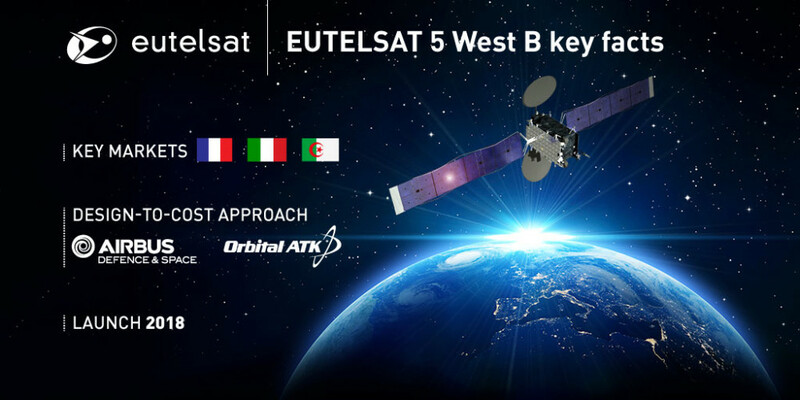 EUTELSAT 5 West B will provide business continuity and improved quality for these services via a Ku-band payload of 35 equivalent 36 MHz transponders connected to three service areas. Switchable transponders will also increase commercial flexibility. EUTELSAT 5 West B is the first satellite to be procured within the framework of Eutelsat’s capex reduction strategy announced in June 2016, applying notably the principle of ‘design-to-cost’. Through an improved match of the satellite’s coverage with specific customer requirements at 5° West savings will be achieved in power requirements and hardware, while maintaining the highest standards in terms of performance. The reduction in the satellite’s size enables a shared launch by an International Launch Services (ILS) Proton vehicle in a stacked configuration with MEV-1, the first Mission Extension Vehicle (MEV) developed by Orbital, thereby reducing launch costs, including insurance. In consequence, significant savings will be achieved relative to the theoretical cost of replicating EUTELSAT 5 West A, without compromising on the quality of service delivered to customers. EUTELSAT 5 West A’s C-band mission, serving mainly data customers in Sub-Saharan Africa, will be discontinued. Service continuity will be provided by similar C-band capacity available on other Eutelsat resources, thereby optimising capacity utilisation rate across the group’s fleet.